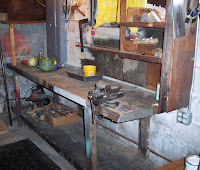 At 28, I moved into my current home which had, and still has, a chunky, heavily-used workbench, with machinist vise, in the basement. My desire to accessorize my home exceeded my budget, so it occurred to me that I might be able to use that bench to build some of the simpler things. So, with hammer, jigsaw, and drill in hand, I started building. Wanting to build more complex things, but having no idea how, I bought this book....and that's when I had a watershed moment. This book changed my life. I pored over every page, studied every tool, every cut, every detail. And in it, my passion for woodworking was uncovered. I saved for an entire year to buy my first major tool: a contractor-style table saw. During that year, I carried in my purse a folded-up article and picture of that saw, studying it frequently and thinking about all of the things I wanted to build. I wonder if I would have discovered my passion if there hadn't been a workbench in my basement or if there had been other turns of events that prevented me from having the time and space to learn. Are we born with a passion that waits for an event that triggers it or is it molded through experiences, events, and interactions with others? Is a passion simply "there" or is it created? I can still recall how it felt to first learn about woodworking. It's the same feeling, when as a six year old, I first started to learn to read. It went beyond excitement. That last photo is one of the first things I built. I no longer decorate in the "9 year old boy, c. 1962, with fixation on the Lone Ranger" style.